Choose from 4 hotels and guest houses in Anglesey. Shown below a just a selection of the hotels available. To search within an area please use the menu on the right. Wavecrest - Only 100 yards from the beach, the guest house has a great location, just 3 minutes' drive from the ferry/rail terminal and 2 minutes' walk from the town centre for pubs and eating places. All rooms at Wavecrest are furnished to a high standard with tea/coffee making facilities and light snacks provided. Also in the room is a TV with Sky Sports and either an en suite or private bathroom. The guest house caters for all ferry arrivals and departures. A hearty full Welsh breakfast is served each morning and can be arranged prior to ferry departures to Dublin. Late arrivals are welcome with prior notice. It is close to pleasant beaches and is situated close to a beautiful South Stack location. The Oak Lodge Inn - The Oak Lodge is on the edge of the delightful old fishing village of Moelfre, which lies on the East Coast of the beautiful Isle of Anglesey. The Oak Lodge has 10 en suite bedrooms, all with welcome trays, TV and central heating. The rooms are individual and vary in size. Full Sky TV is available in the lounge. Bar snacks are available, as are delicious home-cooked meals in the restaurant. Enjoy a relaxing drink in the comfort of the cosy oak-beamed bar and take in the stunning panoramic sea views of Anglesey, Llandudno and Puffin Island. Holland Arms Hotel - The family-run hotel offers clean, functional and good value accommodation, centrally located on the Isle of Anglesey between Gaerwen and Llangefni, in the small hamlet of Pentre Berw. 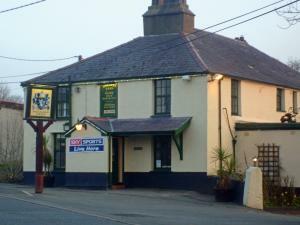 The hotel is just a few hundred yards from the A55 motorway, and Holyhead ferry port is just a 15 minute drive away. The location of the hotel makes it an ideal choice for both a business trip and a holiday break. Enjoy a meal in the dining room, or the carvery on Sundays. Seacroft - In Treaddur Bay, on the stunning coast of the Isle of Anglesey, the Seacroft is a 5-star restaurant with rooms, offering free Wi-Fi, superb locally sourced food and a cosy traditional bar. 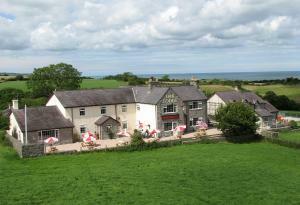 The Seacroft has received a 5-star rating from Visit Wales in its Restaurant with Rooms category. There are 6 individually decorated rooms, each with their own unique charm and each named after one of the beautiful beaches on Anglesey. Each room has a flat-screen TV, Egyptian cotton bed linen and a modern bath or shower room. Some of the rooms have private balconies. With a roaring log fire and superb local food, the Seacroft is a great place to sit back and relax in stylish and comfortable surroundings. There is both a bar menu and a restaurant menu, with the finest, freshest, locally sourced seasonal produce used throughout. Lobster comes from Trearddur Bay itself, from a boat based just a few hundred yards away.